Those of you following me on twitter will know that I have been on a short-lived, but intense, detox this week. The main thing that I wanted to cut out was coffee. I was successful, but it was very difficult! And it always seems to be the way that you want what you can't have, and this week I've been obsessing about cafes I've visited and different coffees I've tried. These visits were all from a few months ago, so I don't remember exact names and prices, but they are all quite reasonably priced. 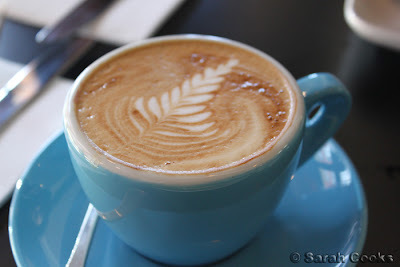 I still haven't decided where to have my post-detox celebratory coffee tomorrow, but if any of you are wondering where to go for your weekend brunch and coffee, may I suggest one of these places? Everyone's blogged about it, so I guess I'd better too. Coincidentally, I nearly moved into an apartment across the street, but I'm glad I didn't. That would have been disastrous for any detox! I've been twice, and the service was definitely better the first time, but it's still a great cafe, and definitely worth a visit. Coffee is clearly the focus, but there's a good range of cakes, sandwiches and cooked items on the menu too. The first time we came here, the coffee was way too strong for Sandra. When we told our waitress, she let us know that they always use a double-shot in their milk-based espresso coffees. A-hah! We'd been wondering why the lattes at coffee temples are always so strong. Sandra would have been happy for them to just bring out a little jug of hot milk, but our waitress said the baristas wouldn't be happy unless the coffee was perfect, so she got them to make a single-shot flat white. Nice! And now we always know to order a single-shot. Now, espresso is all well and good, but I am totally into filter coffee at the moment. It's less likely to be stuffed up, you get a cleaner flavour and - hurrah - there is less residue in the bottom of the cup. I cannot stand coffee with cloudy residue! And he also showed me this cool filter! And then I got my coffee... yum. 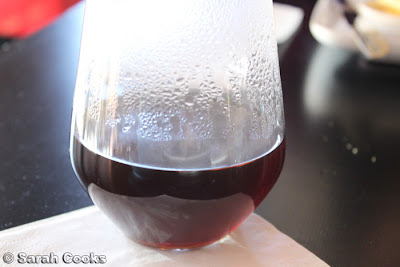 I love the way the steam is concentrated in these sloped glasses, giving you an intense coffee aroma as you drink. This visit was actually a few months ago, so I can't remember what exact bean was used, but they change quite frequently, and there's quite a big range. 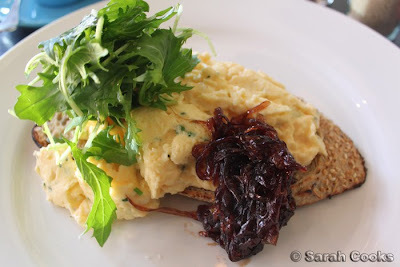 Chive-flecked scrambled eggs with caramelized onions, rocket and grainy toast. 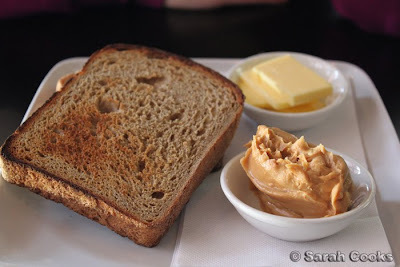 Peanut butter and toast! This was mine. Sometimes even I am not in the mood for a huge cooked breakfast. Now, let's all gasp at their huge espresso machine. We tried to take a photo of the machine as we were leaving, but one of the super-friendly guys behind the counter was all like, "Can I take the photo for you?" and took this awesome shot of the grip-heads from the inside. Thanks dude! I've blogged about Market Lane before, and it is still awesome. Fleur rocks! And I know Proud Mary source a lot of their coffee from here too. I still haven't tried any espresso from here yet, as I can never go past their Japanese-style iced pour over! I like it with a touch of (unhomogenised) milk and a sprinkle of (Costa Rican rapadura) sugar. They had some pretty perfect-looking macarons the last time I went, and in my favourite flavour! Passionfruit and chocolate. The one in the background is pistachio, and was particularly impressive for its natural, subtle nutty taste. Not a drop of artificial pistachio essence to be found! 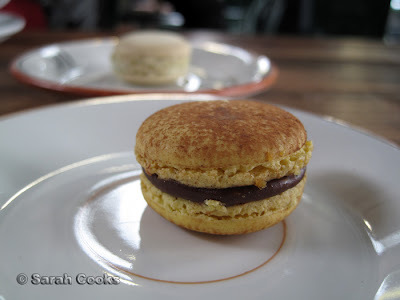 It's almost impossible to find good macarons in Melbourne. I don't mind the delices at the Lindt cafe, but they can be quite hit or miss. Liar Liar is walking distance from my old high school, but don't let that put you off. Compared to Proud Mary and Market Lane, this one seems more focused on the "cafe" than the coffee, and it's a pleasant place to spend a weekend morning, even if it is a little noisy and crowded. From memory, they do have a Clover machine, but the morning I went there, I wanted the familiar comfort of a latte. 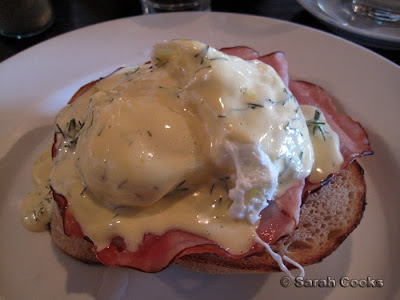 Eggs Benedict, with creamy hollandaise and runny egg yolks. I think it's Dench grainy bread (my fave! 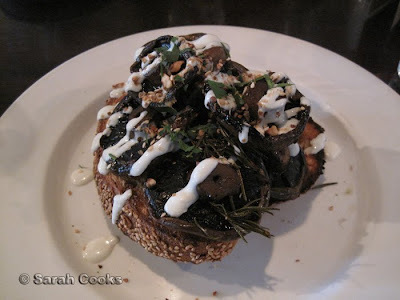 ), and the mushrooms had a satisfying, deeply savoury flavour, which was enhanced by the generous addition of rosemary. I know that these cafes, and many of the new wave coffee temples that have been super-blogged are very similar - single origin coffees sourced from Fleur, Dench bread, eggs benedict, a Clover machine and so on... 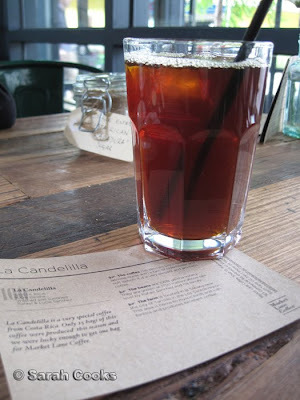 Does anyone have a favourite place to get coffee that's off the beaten (blogged) track? 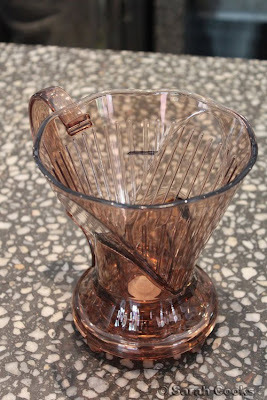 wow that Japanese style iced pour-over looks very intriguing. I would love to try that. 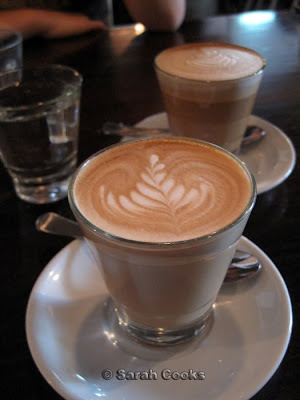 As for coffee spots - well Auction Rooms is my local and while I'm not that enthused with the food (its pretty good I'm just bored already), the coffees are fab. I'm quite partial to the siphon brews. 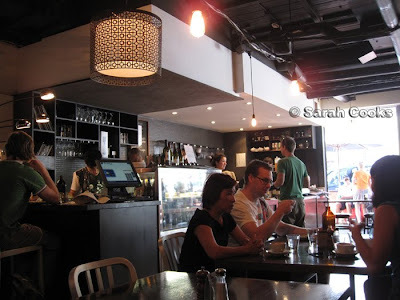 A favourite for food AND coffee is Deadman Espresso. I haven't really explored their coffee options besides a latte and a short mach but their food changes regularly. It's a little on the expensive side but really worth it as everything is extremely high quality. I guess these are pretty standard coffee temples but I haven't seen many reviews of Deadman online which I'm quite surprised about. I usually head to Elevenses cafe in Kensington but with the recent hail, they had to stop business. It is ashame because I know them personally and that is the sort of cafe that I like. Small, funky, local and dog lovers. I hope that they will reopen soon. A coffee-tastic post indeed, I'm not the hugest fan of coffee but funnily enough I've had meals in all these places! Power of suggestion indeed. Sarah you already knbow about this one but...Romeo's in Greythorn. I'd also say Rumbles at Prahran Market, though the coffee is a bit variable. I actually go for the familiarity and the lemon tarts, and the $5 fish auction just around the corner on Saturday afternoons.